Pharrell Lanscilo Williams (/fəˈrɛl/; born April 5, 1973) is an American rapper, singer, record producer, entrepreneur, and fashion designer. Williams and Chad Hugo comprise The Neptunes. They produce hip hop and R&B music. 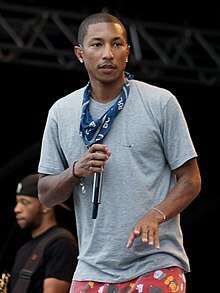 He is also the lead vocalist of the band N*E*R*D. He formed the band with Hugo and childhood friend Shay Haley. He released his first single "Frontin'" in 2003. His first album In My Mind was released in 2006. As part of the Neptunes, Williams has produced many singles for various musicians. These artists include Jay-Z, Backstreet Boys, Blackstreet, Ludacris, Rage Against the Machine, Britney Spears, Busta Rhymes, Garbage, Mary J. Blige, and Usher. The two have earned three Grammy Awards in ten nominations. He is also the co-founder of the streetwear brands Billionaire Boys Club and Ice Cream footwear. Williams became more well-known worldwide during 2013 and 2014, when he was featured on Robin Thicke's single "Blurred Lines" with T.I. (which he produced) and released his own single, "Happy", for the movie Despicable Me 2. Both songs reached number one in several countries around the world, including the US, UK, Canada, and Australia. He was also featured on Daft Punk's single "Get Lucky", another international chart-topper. Williams and model/designer Helen Lasichanh have a son, Rocket Williams, who was born in 2008. The couple married on October 12, 2013. In January 2017, the couple welcomed triplets. ↑ "Pharrell Williams — Ethnicity of Celebs | What Nationality Ancestry Race". ethnicelebs.com. Retrieved 2017-04-12. ↑ "BBC". Retrieved 11 December 2011. ↑ "LA Times". Retrieved 11 December 2011. ↑ Brucculieri, Julia (2017-01-31). "Pharrell Williams And Wife Helen Lasichanh Welcome Triplets". Huffington Post. Retrieved 2017-04-12. This page was last changed on 7 April 2019, at 03:28.